It had been almost 20 years since I'd last visited Steveston, despite living just 30 minutes away for most of those years. We were finally reunited after our two-decade hiatus this weekend - on Sunday, in spite of (or perhaps because of) our car getting broken into the night before, P and I were definitely in the mood for a pint and a bit of an adventure. So, passenger window taped up with a garbage bag (aka ridin' dirty), we headed south-west to check out the beer scene in the riverside Richmond village. We'd heard about Hog Shack through this year's Vancouver Craft Beer Week. 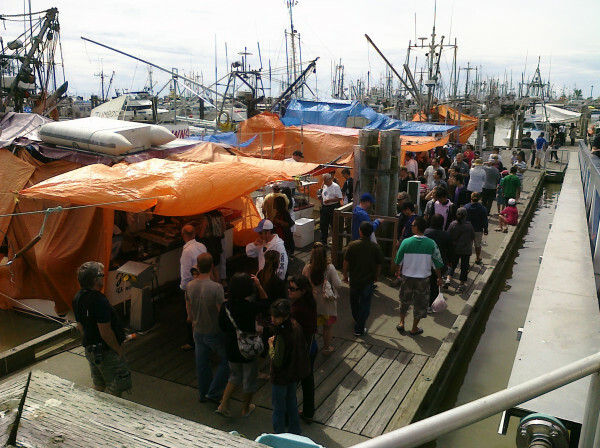 Located on the main waterfront drag of Steveston, they offer (as to be expected by the name) lots and lots of barbequed pork. Not exactly somewhere you'd expect to find a non-carnivore like me on a Sunday afternoon, but hey - we were just there for the beer. Which, we were told, they also have lots of. They also have a patio, although it's not on the water (which probably explained why it wasn't nearly as busy as its neighbour and fellow purveyor of craft beer, Blue Canoe). Now, onto the good stuff: Hog Shack has a great selection of bottles and a decent number of brews on tap (including Elysian, Tree and a few rotators). 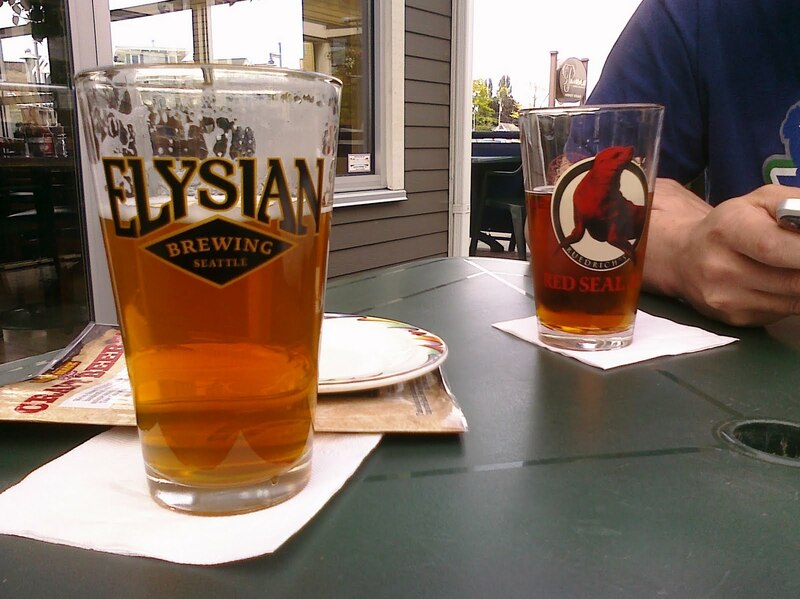 I had the Elysian Avatar Jasmine IPA, which I'd had before. It's a nice, easy-drinking IPA (read: not punch-you-in-the-mouth hoppy). The brewer adds jasmine flowers at the end of the brewing process, which adds a nice floral nose that balances well with the hops. Perfect sipping for a sunny patio. P had the North Coast Red Seal Ale, which was surprisingly hoppy, kind of like an amber IPA. It had noticable carbonation, a nice citrus hop aroma and a rounded malty and hop flavour. Tasty indeed. After we agreed I'd drive home (damn), he also tried the North Coast Le Merle Saison - which was fantastic. As P described it: lighter in colour than other saisons, but not lacking in flavour. Hint of belgian yeast taste, as well as hints of peach and apple. Clean finish, smooth carbonation. The perfect brunch beer. Careful though - at a 7.9% ABV that tastes like it's about a 5%, it goes down shockingly smooth for the amount of punch it packs! Besides the beer, we were able to pick up a vinyl and some cds (yes, we still use those) from The Beat Merchant, some water taffies from the Candy Aisle and some local potatoes and honey from a nearby farm. Steveston, you definitely passed the test. Our moods were successfully picked-up. In fact, we'll probably come visit you again, hopefully sans vehicle so we can enjoy more of your tasty, pint-sized offerings.